For me, it’s all about the butterflies. Always has been, always will be. I’ve turned down possible relationships with potentially good guys, simply because they didn’t give me “that feeling”. And for me, that was a deal breaker! I was foolish enough to believe that my future husband would give me butterflies from the first moment our eyes met, until the last. And look who’s not so foolish, now! That’s right, ladies and gentlemen: he still gives me butterflies. When he comes home from work and kisses my cheek, when he sends me a midday cakey text, when he stops by my job for lunch, etc. etc. But to my surprise, they’re not the same butterflies as before. Now, the butterflies anticipate every moment of our future, and reflect every moment of our past. They are both expectant and realistic. Joyful and humble. Explanation: This past weekend was my bachelorette weekend. 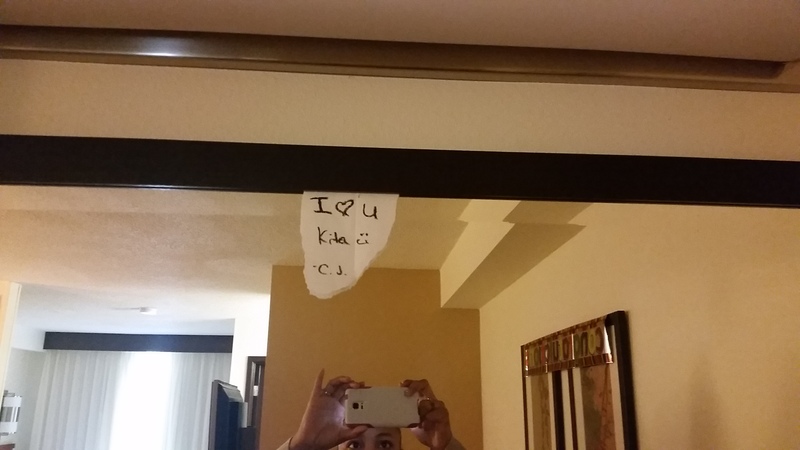 My honey found his way into our hotel suite while we were out, and left this sweet surprise. So, in conclusion, my point is this: never let anyone tell you that YOUR wants/desires/expectations for YOUR relationship are unrealistic or impossible. Your standards are your own. When people tell you that the guy/girl you’re dreaming of doesn’t exist, simply smile and say, “We’ll see.” Because maybe, just maybe…they do exist. I’m the (happy and blessed) living proof.